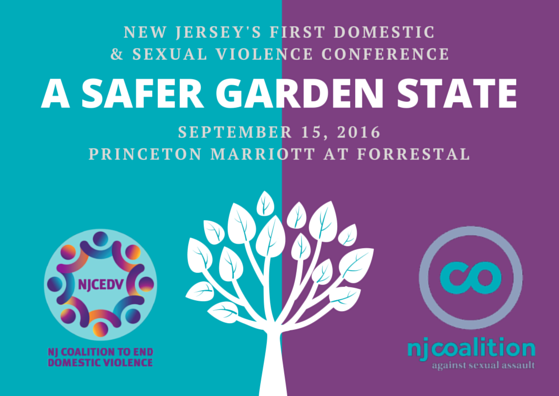 This conference is intended to provide an opportunity for all New Jersey stakeholders, including law enforcement, prosecution, health care, and other partners in the work to end sexual and domestic violence, to hear from colleagues about innovative intervention services, prevention strategies, policy perspectives, and more. Check out the conference’s agenda-at-a-glance and workshop descriptions. The conference is approved by the Rutgers School of Social Work to provide six (6) General CEUs for New Jersey & New York social workers and licensed professional counselors in New Jersey. Princeton Marriott at Forrestal is located a few minutes off of US-1. This conference is supported, in part, by funding from the Robert Wood Johnson Foundation. Please contact Jyoti Venketraman for additional information.